Writing structure — how you handle the first paragraph through the tagline — makes all the difference in how riveting your story can be. Just ask Kathleen Sullivan, communication manager at Local Government Federal Credit Union. During my Reach Readers Online Master Class, Kathleen reorganized a post step by step and wound up with a great blog. What can you learn from her before-and-after when writing blog posts? How does “emotional intelligence” influence your relationship with money? For her rewrite, Kathleen added a deck, which allowed her to take some of the lead out of the lead. The resulting five-word headline made the story more provocative. And the deck seems to be suggesting that I might learn something that would help me make or save money. I’m in! Could Emotional Intelligence affect your finances? The introduction has three parts: the lead, the nut graph and the background section. A. Lead. The job of the lead is to draw readers in. In the original, Kathleen focuses on how the sausage was made … the abstract process behind the findings. Yaaaawn! Who cares about these interviews? Not me! A self-made millionaire interviewed some of the world’s wealthiest people – and others who are financially average – to ask about their relationships with money. His key takeaway? But Kathleen’s revision gets me, the reader, into the story. And I, like all of your readers, am my own favorite subject. Moreover, she sets up a surprising scenario that grabs attention and pulls readers into the piece. Have you ever gone out to buy milk and come home with a new car? B. Nut graph. The job of the nut graph is to tell readers where you’re taking them. Kathleen’s original story was organized in the inverted-pyramid format, which has been proven in the lab to reduce reading, understanding, engagement and more. Inverted pyramids don’t include nut graphs, so Kathleen’s original story skipped this element too. That’s probably the influence of emotional intelligence, or EI, a force that guides many of our purchasing decisions. C. Background section. The job of the background section is to give readers any information — a definition, bit of context or history lesson — they need to know before they dive into the body of the story. But background is also known as blah-blah. Don’t let blah-blah get between your readers and your story: Keep this to one short paragraph. In her original version, Kathleen delivers too much background, at 270 words. And it’s too technical: Adaptive regulation? A combined perceptive and cognitive integration of emotions? Correlated to a positive orientation? Negative early engagements? No, thank you! Most wealthy people think about money logically, while average people see money through the eyes of emotion. This conclusion may seem simple, but its implications are far-reaching. The adaptive regulation of emotion is called “emotional intelligence.” Psychologists say emotional intelligence is a combined perceptive and cognitive integration of emotions. A higher emotional intelligence is correlated to a positive orientation toward money and a greater sense of economic self-worth. When one’s perception of money is rooted in a negative emotion – such as anxiety, guilt, or fear – impulsive and possibly destructive financial habits may follow. These perceptions are usually developed at an early age, when parents may unwittingly – or perhaps intentionally – share their own emotions with regard to money. Regardless of how you view money, individual positive or negative financial circumstances play a defining role in your life. After all, money can provide freedom, security and safety. The lack of money can leave you feeling vulnerable, trapped or frustrated with limited options in life. Since emotion is usually the fuel of behavior’s engine, pinpointing the source of negative emotion toward money is vital. Research suggest that negative early engagements with money may have forced financial deprivation or perhaps, instilled the perception that money was an elusive but crucial element for happiness during one’s upbringing. Once an intense reaction to money is identified, steps can be taken to control or even eliminate behaviors that sabotage financial security. The most effective way to improve emotional intelligence with regard to money is to identify, rather than avoid, a financial concern. Recognizing money woes or acknowledging personal financial irresponsibility is the start of building better EI. FYI: Too much background information is one of the most common problems I see in corporate communications. Kathleen’s revised background section is still a little long for my taste. But at 109 words, it’s 60% shorter than the original. Her words are also shorter — about 10% shorter — and easy to read and understand. Now it sounds as if she’s telling me about this story on the elevator on our way to lunch. Even better: It’s about me! EI measures emotional self-awareness and the ability to control it. Experts say higher emotional intelligence points to a better relationship with money and a greater sense of self-worth. If your view of money stems from negative emotions — like anxiety or fear — harmful financial habits may follow. These ideas usually develop early, when your parents may have shared their own ideas of money. Regardless of your money view, your financial health plays an important role in your life. Money can provide freedom, security and safety. A lack of money can leave you feeling anxious or frustrated. Recognizing money woes or admitting financial irresponsibility is the start of building better EI. Here’s where you develop your story. In Kathleen’s original, the meat of the story — the tips — are buried under 296 words of abstraction. Do’s and don’ts usually have a format: DO do this. DON’T do that. But instead, Kathleen used nouns. Those aren’t tips. Denial: Don’t ignore signs of financial peril. Escape: Don’t fall back into patterns that reinforce unhealthy financial behavior. Most patterns – regardless of the damage they may cause – are still familiar and comfortable. Awareness: Do stay aware of account charges, bank balances and other financial data that help you stay informed of your financial health. Plan: Do create a proactive plan and establish goals. This will help to decrease the intensity of an emotional reaction to money and can improve overall EI. Don’t ignore hints of financial peril, like poor credit scores, calls from collections agencies or other signs. Don’t lapse back into unhealthy financial behavior. Patterns are still familiar and comfortable despite the damage they may cause. Do stay aware of charges, bank balances and other financial data that help you focus on your finances. Do create a plan with goals. This will help reduce the intensity of an emotional reaction to money. The conclusion has two parts: the wrapup and the kicker. A. Wrapup. The job of the wrapup is to draw to a conclusion. Kathleen’s original sticks with the technical language. Eleven of these words have more than two syllables. That’s a lot! Experts say that increasing emotional intelligence will have benefits for behaviors beyond the boundaries of money. Better emotional intelligence helps you stay aware of all behaviors in your life, critically assess your actions and align your behavior with your life’s goals. Experts say that increasing EI helps you stay aware of your behaviors and helps you align those behaviors with your goals. Improving EI also can help you avoid buyer’s remorse today and achieve your financial goals tomorrow. B. Kicker. The job of the kicker is to end with a bang, to leave a lasting impression. Inverted pyramids don’t include kickers, so Kathleen’s original doesn’t, either. But in the revised story, she ends with a bang and circles back to the top in a concrete, creative provocative final paragraph. And that may leave your biggest decision to be whether you buy whole or skim milk. Cut word count by 33%. Cut sentences per paragraph by 17%. Cut characters per word by 9%. Writing structure is such one of the most important writing skills. Before you start writing a blog post or other social media piece, spend a few minutes organizing it into this structure. Whatever your blog post topic, create a blog post that, like Kathleen’s, keeps readers riveted from the first paragraph to the last line. Did you know there’s a writing structure that that’s been proven in the lab to attract 300% more readers and 520% more reading, increase social media shares and boost understanding, engagement, interest, satisfaction and more? Would you like to master this structure? 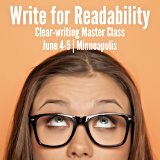 If so, please join me at Reach Readers Online — our 3-day digital-writing workshop on July 24-26 in Portland.